With the Kepler extended mission in full swing, we have added some new data to the source pages to help your investigations. If you don’t know what a source page is, it’s where we show all the light curve data for a given Kepler target that we have uploaded on the Planet Hunters website as you would see it in the main classification interface. We show roughly 30 day light curve segments in the main Planet Hunters classification interface, so on the source pages you can peruse the other light curve sections. In addition the source page is the place where you can get the Kepler ID of your favorite star and look up other information about the Kepler source. You can get to the source pages by clicking on the “Examine Star” link (see below) on any Talk light curve page. Download Data: The Download Data link will download to your harddrive a csv file of all the light curve data we have uploaded for that star. Kepler Archive: The Kepler Archive link will take you to a Kepler Catalog Search which outputs the Kepler id of the star, it’s position on the sky (right ascension and declination), magnitude, colors, etc. The Kepler TPS: In the Kepler Extended Mission, the Kepler team is now releasing their list of Transit Crossing Events (TCEs) from their main Transiting Planet Search (TPS) code. A TCE from TPS is not a planet candidate. It’s a possible series of linked transits, identified by TPS that has hit the criteria for being considered a detection. There’s a lot of work needed to go from TCE to planet candidate. TPS detects may thousands upon thousands of TCEs and most of these are false positives. So lots of other checks have to be made to validate the possible transit detection to a planet candidate. For the Quarter 1-12 run of TPS there are over 18,000 TCEs. The TCE list has not been vetted by the Kepler team. Probably only a few thousand are actually real. Provided by the Kepler team is the data validation report for each TCE. This is the output from their data validation pipeline of some tests to assess whether the TCE may be a real planet candidate. (You can learn more about the TCEs and other data products provided in the Kepler Extended Mission here.) The Kepler TCE link will search the TCE list and report back if there was a hit on the TCE list with some info about the properties of the detection, which you can then further investigate on the NExSci website. If there are columns names and nothing else when you click the Kepler TPS link that means the source is not on the TCE list. UKIRT DB Link: The Kepler pixels are rather large. Each pixel in a Kepler image is 4 arcseconds. The typical photometric aperture radius for a Kepler target star is 6 arcseconds, and all the photons collected by the CCD within that radius are assumed to come from the target star and summed to make the Kepler light curve you see. With such a wide aperture, stellar contamination and photometric blends are a concern. Adding linearly, the contribution of extra light decreases from other stars within the Kepler aperture causes the observed transit depths to be shallower than they really are. Accurately estimating the size of the transiting planet requires knowledge of the additional stars contributing to the Kepler light curve to correct for this effect. Also knowing there are additional stars in the Kepler photometric aperture is important because it can help identify that a Kepler source;s light curve is being contaminating by a nearby star that is an eclipsing binary. 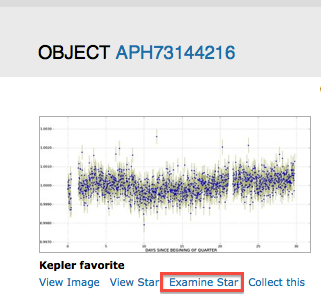 By clicking on the UKIRT DB link, you get a search reporting back UKIRT J band (near infrared) images of the Kepler star from the WFCAM Science Archive. The typical pixel scale is 0.8-0.9 arcseconds per pixel, which allows us to zoom in within a few arcseconds of the Kepler target. (Thanks to Mike Read from the WFCAM Science Archive for helping set this up and to Phil Lucas for generously letting us link to the data in this way). Other updates to the site include updating the lists of known eclipsing binaries, false positives, and Kepler planet candidates. The Kepler team last week released their list of planet candidates and false positives from analysis and vetting using data from Q1-Q8. The Talk labels have been updated to reflect this. The eclipsing binary list comes from the July 2012, since that’s the last static list to be released.